Pets must be authorized. Cat fee is $20/month and must be over 6 months old. Dog fee is $40/month and must be over 12 months old and weigh under 25 lbs. There is a $300 refundable deposit for each pet. There is a 2 pet limit. 2803 and 2807 S Beck Ln are conveniently located near the new State Road 231 which runs directly to Purdue. It is a 1/2 block from the old SR 231. 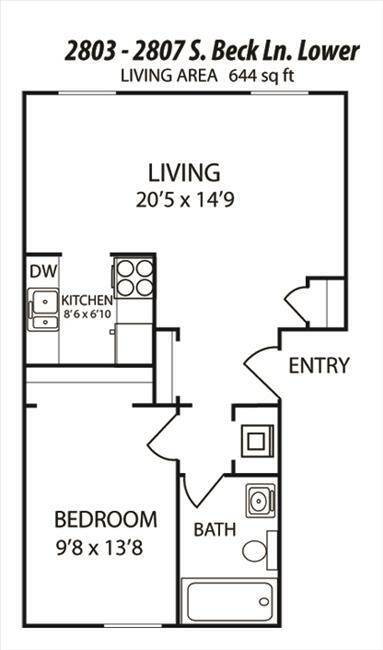 At 644 sq ft these apartments give you a nice size living room and dining room area. A few apartments have carpet in the living room and most have been updated with laminate floors. They each come with its own stackable washer and dryer. There is a wall unit air conditioner, and in the uppers there is a vaulted ceiling and a skylight. They have a patio or balcony depending on the floor. Resident pays for electric and landlord pays for water, sewage and trash. Pet Policy: Pets must be authorized. Cat fee is $15/month and must be over 9 months old. Dog fee is $35/month and must be over 12 months old and weigh under 30 lbs. There is a $300 refundable deposit for either pet. Second pet is an additional $100 deposit. There is a 2 pet limit.